nobbi dragon | Frank & Donnis Travel Blog "the more we see the more there is to see"
The work of struggling with the mower and the thick, tall and wet grass continues. It was 7° in the kitchen at 7am this morning. Of course it is not so cold that a few layers of warm clothing – in the middle of summer – will not fix. The sun was 60 / 40 today but the wind was 100% cold from the south. I was reminded that we have just two weeks left of our house sit in Guyra and after that the next stage of our travels begins. We will re-visit some locations and find some new destination s over the next two months. Hmmm! There were so many things I had planned to do while here in Guyra but some of those plans were shelved due to the miserable weather. Also with the CO-PILOT not being well and staying on the coast to recover for a few weeks, she is not here to share any adventures! ABC Radio have a website and ask for contributions of photos and or stories as per a schedule they have mapped out. This month’s photo project is “Letterboxes” so I sent three photos of letterboxes I have photographed over the last two years. As well they are asking for a 500 word story on a Scary Moment. Today I wrote a 500 page story and sent it to them by email. It sure beats pushing a recalcitrant mower through thick grass. 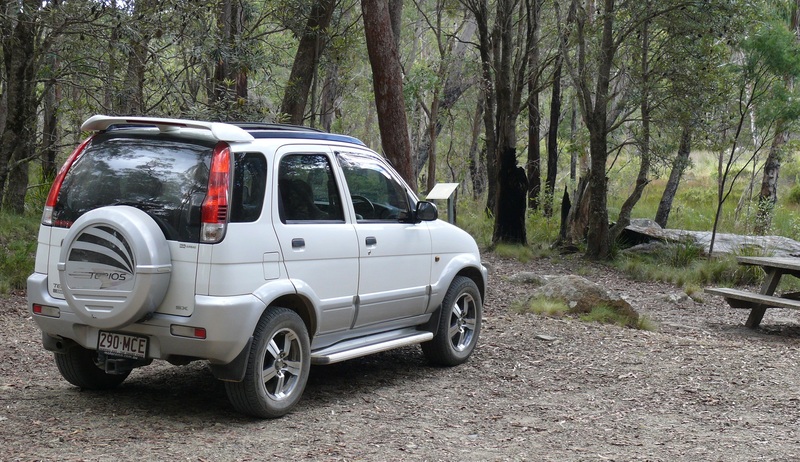 ABC Radio accepted my letterbox photos and asked for a photo to accompany the scary story I sent them. Today was my usual day to do grocery shopping and other tasks in Armidale. A chance conversation with the Barber while getting my annual haircut (just kidding, it’s really a bi- annual haircut – just kidding again, it’s really, not kidding this time, my second haircut since arriving in Guyra at the end of October) provided me with interesting additional information about Guyra which, I am about to share with you. He told me lots of interesting, strange, weird and frequent events happen at Guyra. 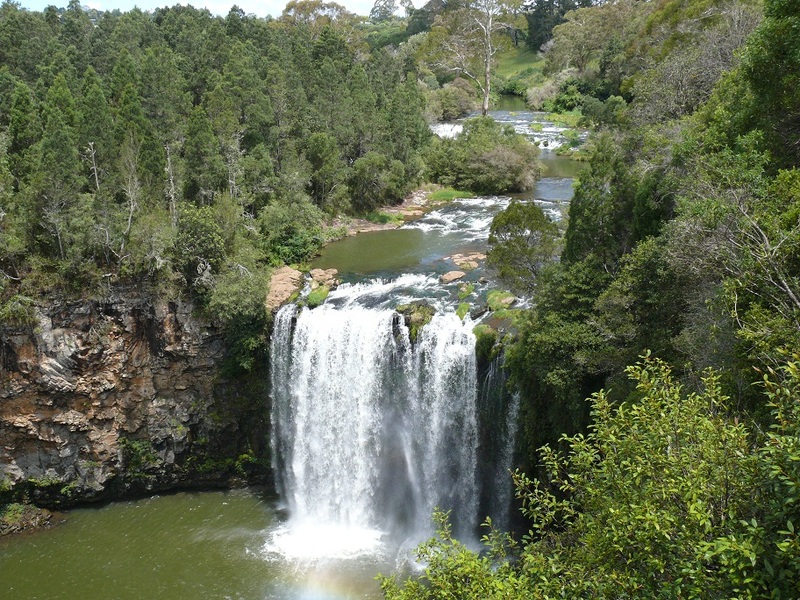 The town water supply referred to is known as Llangothlin Dam and is only a few Klms north and east of Guyra township. That mystery remains unsolved. The family who reported the event, are named Ward. Their property and surrounding area was, prior to the sighting and still is, known as Wards Mistake. Hmmm! What was the first mistake made by Ward? Delivered to RAAF 01/06/73. Crashed, 02/04/87 near Tenterfield NSW. Crew of FLTLT Mark Fallan and FLGOFF William Pike Killed. Delivered to RAAF 25/07/73. Served with 6 Sqn. Crashed, 28/04/77 5 nm south of Guyra, near Armidale NSW (6 Sqn) due Fuel tank explosion/loss of control. RAAF Ejection number 49. Crew; CAPT (P) W. Baker USAF, FLTLT (N) D. Clarkson, both Crew survived ejection. Delivered to RAAF 01/06/73. Flown to and displayed at RAF Fairford for Royal International Air Tattoo (RIAT) July 1993. Crashed, 13/09/93 near Guyra NSW. Crew of FLTLT Jeremy McNess & FLTLT Mark Cairns-Cowan of 1SQN Killed. Australia took delivery of 47 F-111. 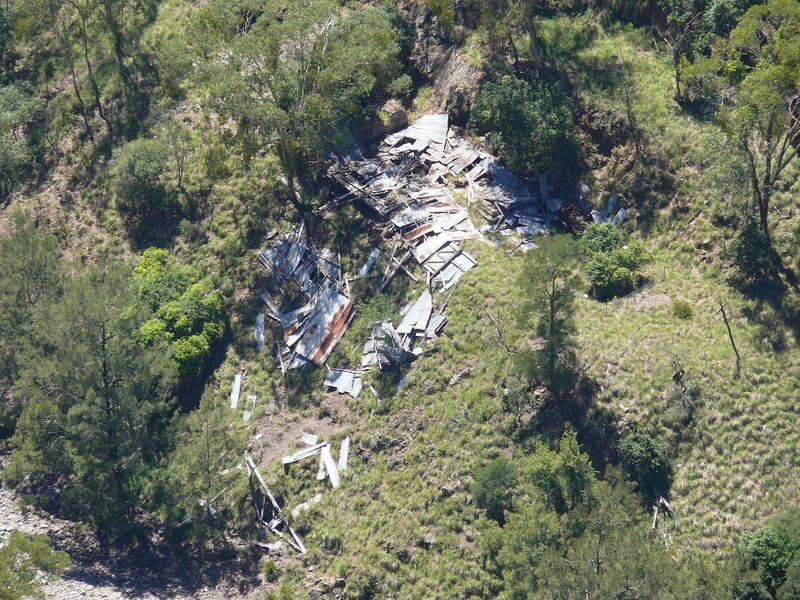 There were 5 crashes on Australian soil (some planes were used overseas) Three of those had fatalities of both crew members and the remaining two had successful ejections. Two crashes were at Guyra and one at Tenterfield nearby. Not bad statistics for a small town in New England. Guyra Council has erected a memorial plaque on the front lawn of its chambers, commemorating the 1993 crash and loss of life. I visited the memorial and really had to seek it out it being disappointingly small and close to the ground. 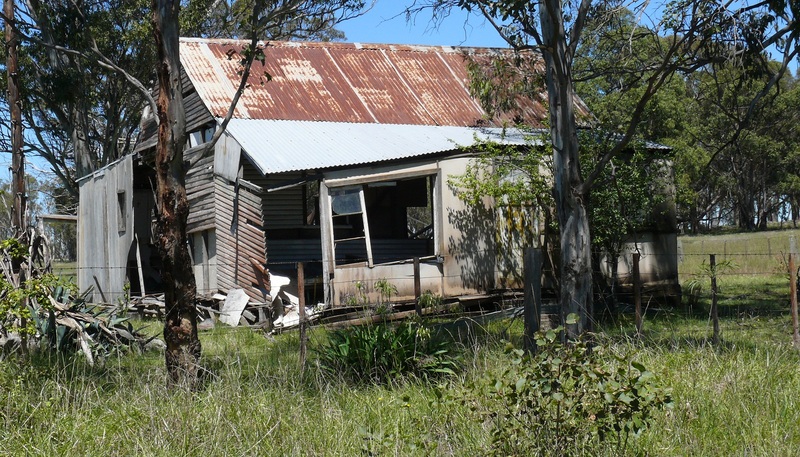 Another snippet of history given by the barber was another ghost story of a property near the bottom of Devils Pinch, a steep part of the highway on the way to Armidale. The barber recalled a rhyme that was often chanted when he was a young boy. Of course the barber could not remember the Sergeants name. There were reports of a ghost appearing beside a well on the property. My research turned up the following…”Claude Heagney’s murder at Guyra and the early 1960s cover-up, years later produced a death bed confession…by a Police Sergeant!” When trying to access the Guyra Argus Newspaper archives I received this…”Sorry, this page is temporarily unavailable”. I also located many murders, murder suicides, attempted murders, attempted suicides in Guyra over the last 100 years. The barber was correct when he told me lots of strange, weird and fascinating things happen in Guyra. In the morning I went to the Guyra Argus offices to ask access to their archives. Darn! They are closed Thursdays and Fridays. ”. I will follow through on this story when the Argus opens on Monday. In the afternoon I washed TERIOS, vacuumed inside and cleaned all appropriate surfaces with Armour All. A bright sunny day, with for Guyra, heatwave conditions of 25°. I took a drive along the New England Highway to Armidale then turned onto the Armidale – Grafton Road, also known as the Waterfall Way. 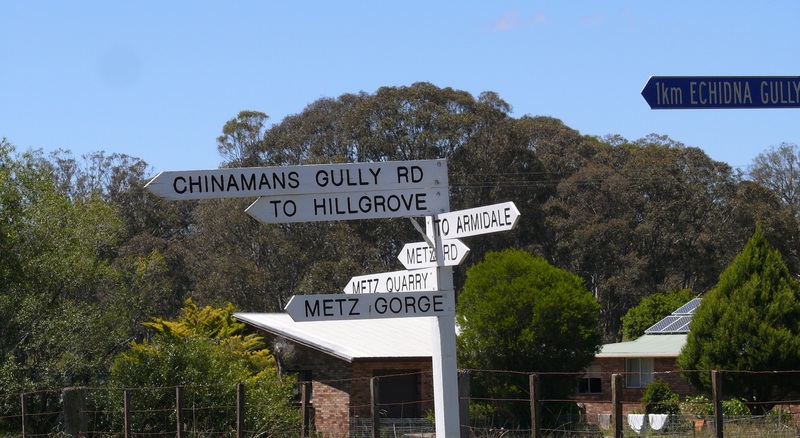 On post 289 we visited Gara Gorge, Bakers Creek Gorge and Falls and Hillgrove. Collapsing and abandoned house. I wonder what standard of workmanship caused this? On the road to Metz Gorge. 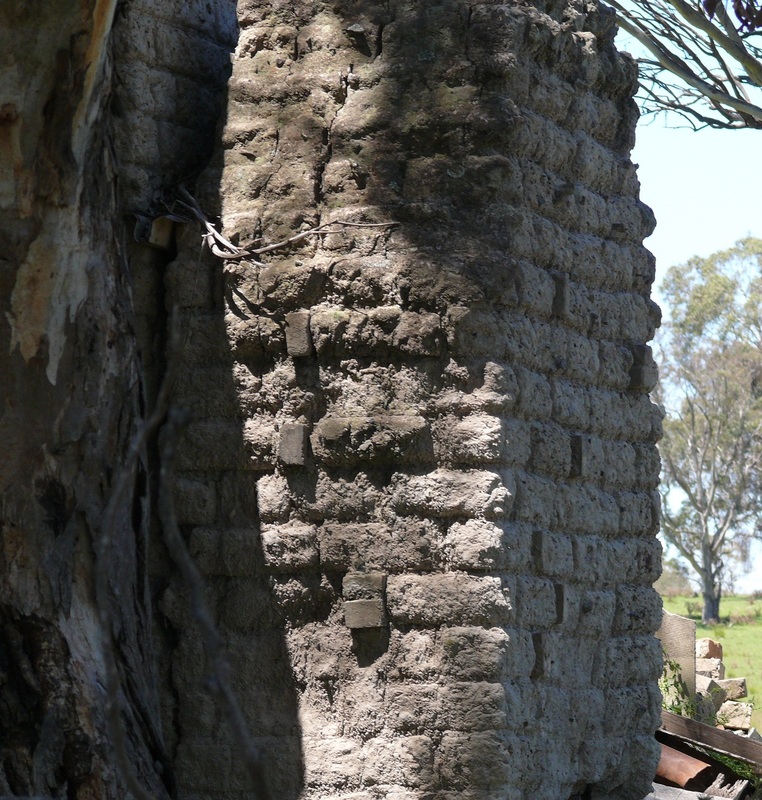 The collapsed house has a poor example of mud brick and regular kiln fired bricks in this chimney. The tiny village of Metz has no shops but has one big sign. Today my first destination was Metz Gorge which is on the opposite side of the gorge where the Hillgrove Mining was carried out 100 years ago. 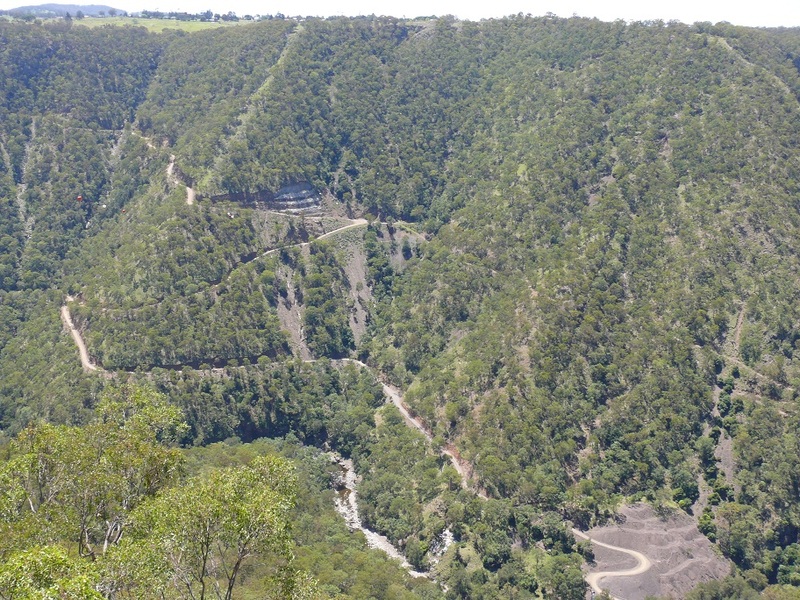 (in fact gold mining has been re-opened on the Hillgrove side of the Gorge) The access road was gravel and appeared to be little used according to the potholes and washouts along the narrowing track. This was turning into a 4WD adventure. 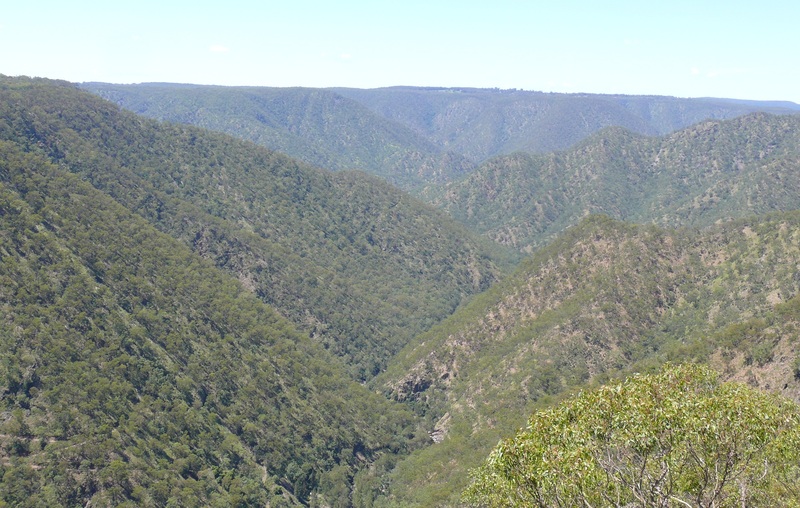 The track ended with spectacular views over the gorge. The walking track, overgrown with long grass led to a viewing platform which was partially covered with soil washed down the hill from recent heavy rains. 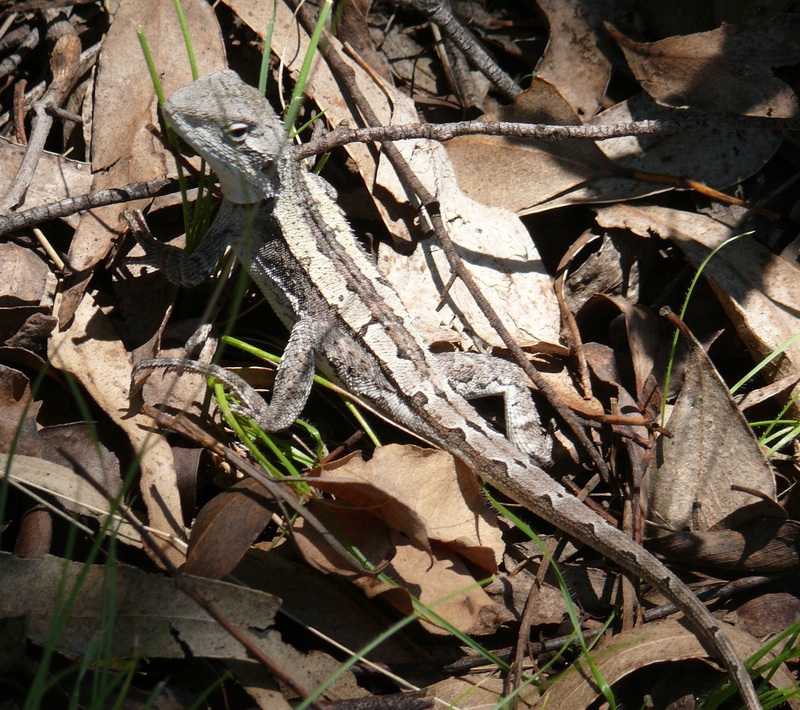 This little Nobbi Dragon skittered across my path as I walked to the viewing platform at Metz Gorge. From here the viewing platform was suspended over a sheer drop to the gorge around 220m below where I could see the river winding through the valley floor and the access roads and mining works of the Hillgrove Gold Mining operations. 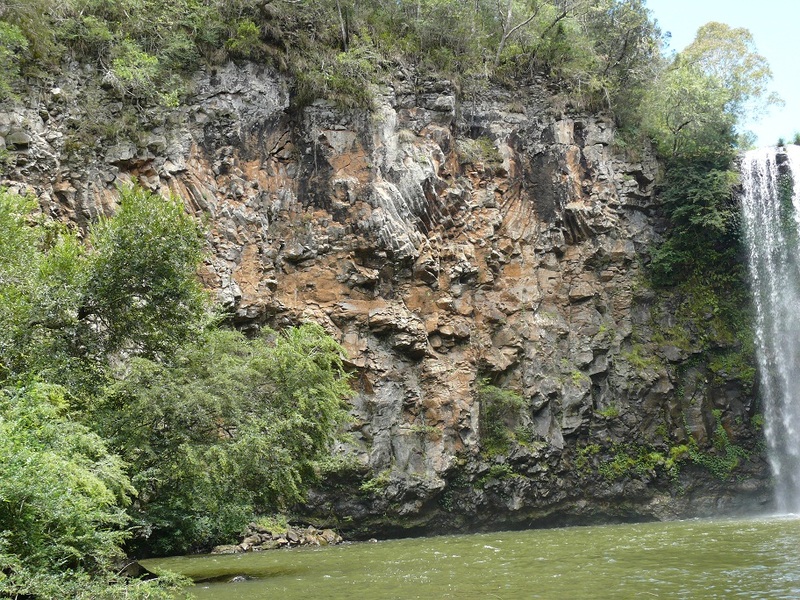 The Metz Gorge , which is part of the Oxley Wild Rivers National park. Metz Gorge. Note the gravel track to the river and the gold workings cut into the hillside. Remains of a mining shed which appears to have been blown apart. Dangar Falls at Dorrigo. As seen from the viewing platform. The entire area stretching 115 Klms to Armidale and New England is all part of ancient volcanic lava flows. The curved and irregular “organ pipe” structure is caused by shrinkage of the lava as it cooled. The continued slow movement of the lava during the cooling process prevented it from forming regular hexagonal columns. 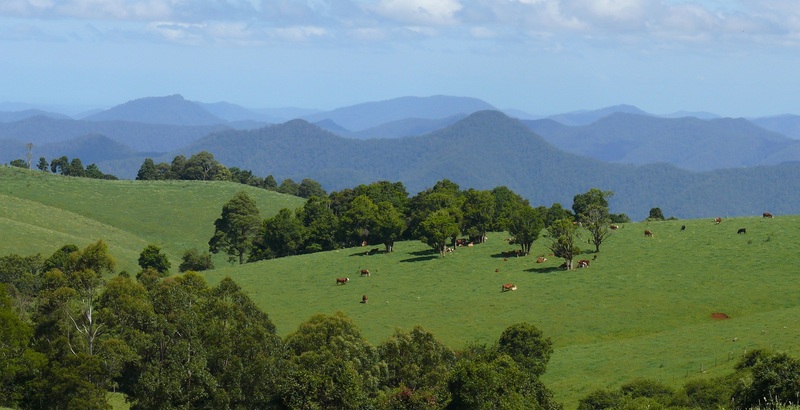 Dorrigo and surrounding area is on the edge of the escarpment, all part of the Great Dividing Range. 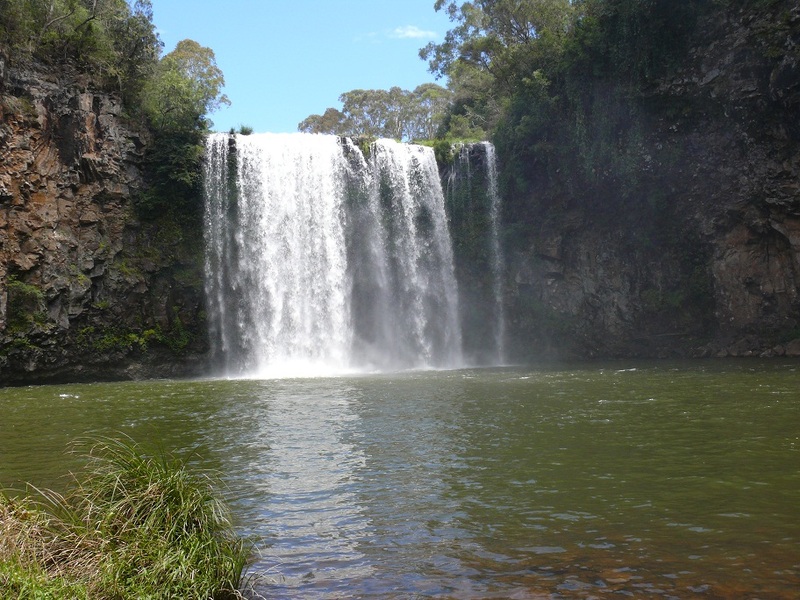 The falls themselves are none the less beautiful with a large volume of water cascading into the pool below. Apart from a viewing platform a steep path and timber bridges gives access to the pool below the falls. A fine mist was rising from the water keeping the ferns moist and healthy. 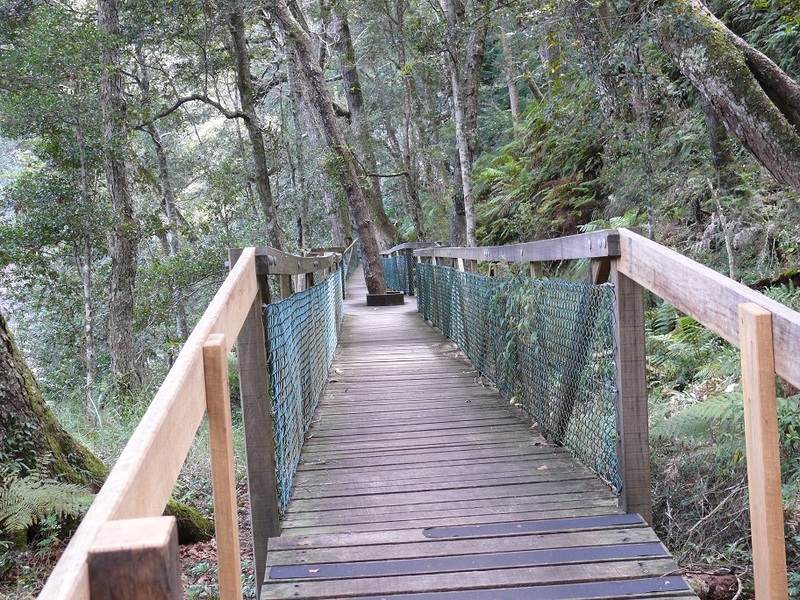 One of the timber walkways on the track to Dangar Falls. 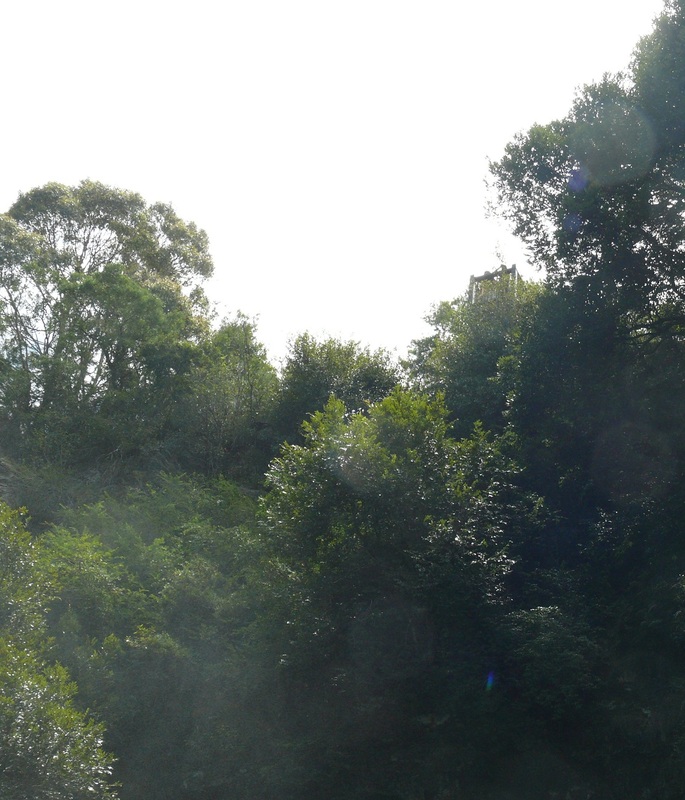 Looking up at the Dangar Falls viewing platform. 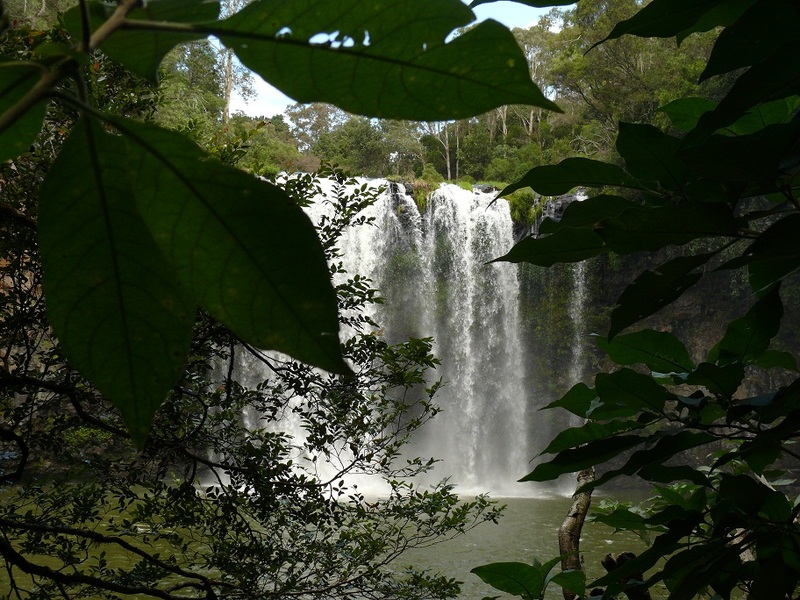 Dangar Falls from the rainforest foliage near the natural pool. Dangar Falls and the drifting mist as seen from the base of the falls. On the way home I visited Round Mountain and Cathedral Rocks National Park. Wild mountain ranges in the Oxley Wild Rivers National Park from the Dorrigo Hillside on my way to Round Mountain.. Unfortunately the rock views and most visual part of the park required a three hour walk and at 4pm it was too late in the day to tackle that sort of walk especially as I was alone and nobody knew I was there. Carpark and camping area of the Cathedral Rock National Park and Round Mountain. The access track to the Radar Installation referred to in last weeks post begins here. With all the gravel roads travelled yesterday, TERIOS needed another bath this morning. Also bathed Toto who had rolled in something not very nice and most likely, dead. I started packing things in WWWGO. Things which were no longer needed until we set up camp again. The countdown is on. This will be our final week in Guyra and new adventures await us.